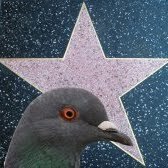 PMDb - The Pigeon Movie Database: Matrix: are there pigeons in Matrix? 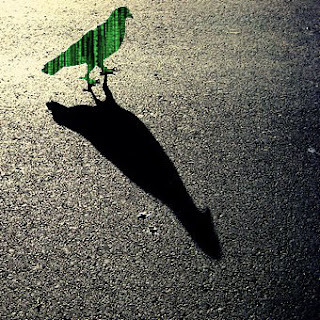 Are there pigeons in Matrix? This is a tricky question that requires some analysis. Firstly, I would like to remark that there are pigeons appearances in the film: during Neo's training, he and Morpheus enter a program that recreates Matrix. Suddenly, everything in frozen and Neo meets face to face with a reproduction of Agent Smith. In the following images we can see a couple of these feathered creatures behind Neo and two other more in from of him, far away. The complete scene can be seen here. In the film scene Neo and Morpheus are more interested in the deadly agent than in the flying pigeons - logically. However, neither both of them are surprised about the pigeons' presence... which means that both of them are used to seeing pigeons... given that both of them come from Matrix. That means that yes, there are pigeons in Matrix. Otherwise, they wouldn't be used in this scene. However, this answer raises another question that is even more intriguing: are pigeons real creatures in Matrix or are they mere software reproductions? A lot of analysis has been done on the agent role but a little attention was paid to the pigeon appearances and their significance in the film. According to the Second Renaissance story of Animatrix, humans and machines fought a war that completely devastated the Earth and ended with mankind's demise. Humans, in a desperate attempt to deprive the machines of solar energy, completely darkened the skies. In the end the humans were defeated and machines destroyed all traces of civilization, enslaving the remaining survivors. Meanwhile, without light, all the vegetation died and the natural food pyramid collapsed killing all the living animals. The lack of plant life is a very depressing scenario that is also reflected in other movies like John Hillcoat's The Road (it is a shame that the birds that appear in this movie are not pigeons). Scenario A: all the pigeons died during the war but the machines recreated them as software applications. That is, pigeons are mere artificial programs that are working for Matrix itself. Scenario B: a pigeon fancier survived the holocaust with his birds. After the war both fancier and pigeons were captured by the machines and subsequently enslaved. It is also possible that some urban pigeons survived alone. In both cases pigeons are real creatures trapped, like humans, by the machines. In the following sections I will analyze each scenario in more detail. In this scenario the pigeons are mere programs belonging to Matrix. Why are they used? Why not just leave them out? The straightforward anwser is to produce a realistic city recreation... in the end, a city without pigeons is not city at all, is it? However, there is a darker reason for using artificial pigeons: they can be employed as a surveillance system. 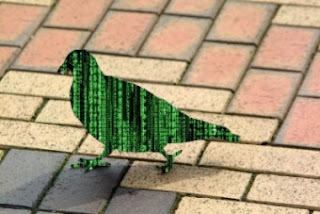 In this hypothesis, pigeons are like agents, they work for Matrix but in a more passive way: instead of killing human rebels, they only gather information. For instance, when you are in any city or big town you can find pigeons everywhere... now try to imagine that each one is recording and reporting your actions....terrible!! What about if we are actually in Matrix and pigeons are spying on us? After thinking about this, now I notice pigeons in a different and more sinister way. In this scenario some pigeons survived the human holocaust and were captured with the remaining human survivors. Machines needed an alternative power source and discovered that humans could be used as batteries. Why not use pigeons in the same way? Of course, they would be smaller batteries, so pigeons have less power than humans, but they also have better reliability which can be advantageous. For instance, they will never revolt against Machines. In this scenario pigeons will live in Matrix with infinite joy populating all the buildings and not causing the system any problems. In Matrix Reloaded, Neo meets the Architect and Neo affirms that the machines need humans for power. The Architect says that he is wrong, -there are levels of survival we are prepared to accept- he says. Is he saying that machines can use pigeons instead of humans? In the real world some artists concieved a similar idea to this one: to use a matrix of chickens for food production in industrial environments. A Chicken Matrix could be even more horrifying than the pigeon Matrix suggested in this scenario. Artist's representation of Neo-Pigeon waking up after eating the red bird seeds (maybe it finished both the blue and the red seeds). Neo-Pigeon discovers that both humans and his pigeon-colleagues are actually trapped in pods and used for power generation. 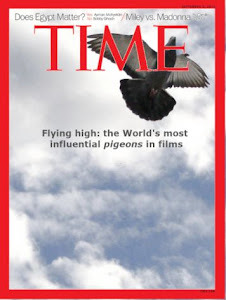 Pigeon activity: They are common pigeons flying in a square, as part of a Matrix recreation. Symbolism: I think that pigeons are used in this scene to prove the quality of the special effects. The complete scene is frozen. Without pigeons, some spectators would think that all the characters (including Agent Smith) are static. However, showing frozen flying pigeons proves that the whole scene is actually frozen, providing extra realism. Relevance: None. Pigeons are completely ignored by all the characters. Training level: Average. They fly away in a realistic way but they have little presence given that most of the time they are frozen. If you look at the second movie, you will see that while the Oracle is talking about programs with Neo in the square, before the arrival of the Smiths, there are pigeons in the square eating (seemingly autonomous and simple programs). I believe the organism dynamic in the matrix, (that is, the creatures in it all the way from the blue whales in the sea to the bacterium under peoples toenails) is a vast architecture of code with its own balances and imbalances. (Explaining evolution in a Darwinian sense) Something that most pigeon breeders are known for liking. I hope this inspires you. Btw, just found your blog and I absolutely love it! Great job!